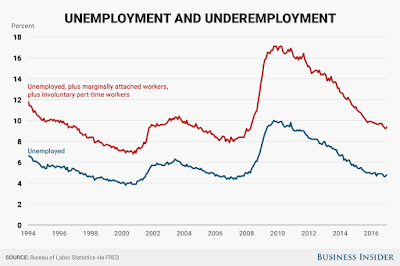 During president Obama's tenure the mainstream media never reported on the U6 unemployment rate (which includes those who have given up looking for work as well as those who are 'underemployed' and spent several months at 17.1%) , preferring to make president Obama look good, so instead focused on U3 unemployment which peaked at 10%. Meanwhile president Trump has been in charge of the executive branch for 6 months and U6 has already dropped from 9.4% to 8.6% (although it was as low as 8.4% in May). At that pace, president will have U6 unemployment down to 3% by the end of his first term. Impressive. Nevertheless, the media has suddenly discovered U6 (because U3 remained flat month over month and could not give them the negative headline they needed to bash Trump. They've just used U6 as a cudgel to bash president Trump. 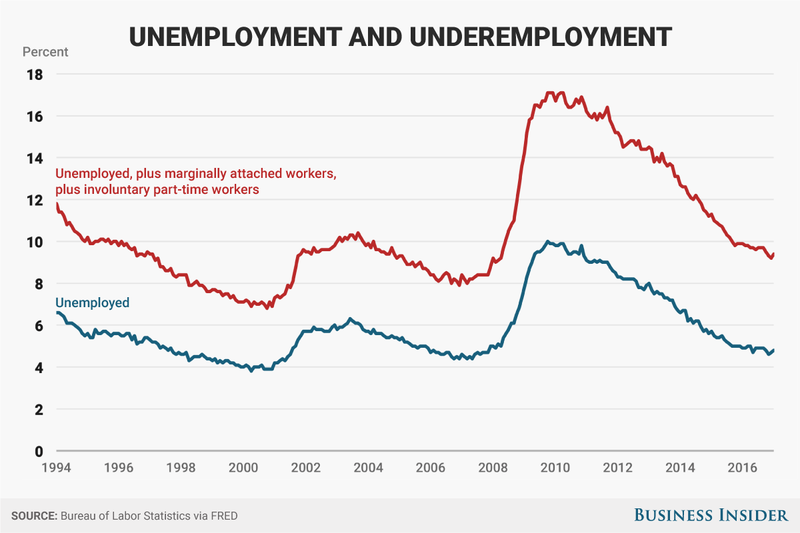 An alternative measure of unemployment that counts discouraged workers and those holding part-time positions for economic reasons — the underemployed — rose from 8.4 percent to 8.6 percent. Wage growth, however, remained muted, with average hourly earnings rising 2.5 percent on an annualized basis, essentially unchanged from the previous month. On a monthly basis, the rise was 0.2 percent, which actually was a shade below the 0.2 percent expectation. The average work week edged higher, rising 0.1 hours to 34.5. There's no bad news in that. 2.5% wage growth is reasonable and might help keep inflation low and therefore interest rates. Oh, and the number of employed in America is at a record high. I guess the good news is that after nearly a decade of ignoring it, the mainstream media seems poised to acknowledge U6. Suddenly Lindsey Graham has guts? The least Trusted Name in News. CNN, and on it goes.